UPDATE: September 22nd - Independent sources agree Hoboken does not have the votes to beat Ironstate re: the Barry's and Applied tomorrow night. While Anthony "Stick" Romano will vote no, it's under the proviso a majority of the nine member body will not be joining him to vote down the Monarch Project. Expect a little dog and pony show if Hoboken residents show up but this is where sources believe the vote is headed at the county. One county source reportedly is pointing the finger at Mayor Dawn Zimmer saying she would not "negotiate" the Monarch project's twin buildings. That political barb fails to address the reneging on building tennis courts and parking at that location originally agreed upon. Others will look to Councilwoman Beth Mason and ask what she did? As some may recall, when a second ward resident first raised the issue to both her and City Hall, Mason ignored the communication and it led to further questions about her political behavior and actions. Expect to see her make a release showing solidarity with the residents of the Hudson Tea Building and the second ward. But what is she actually doing? In City Council, Mason has politicized legal work for the City and even voted against legal action to stop the Monarch (before switching her vote). In the end, she's not going to bite the hand that feeds her votes (in Applied Housing) in the second ward, which largely explains her continued support for the ousted Hoboken Housing Authority's Executive Director. The rest of the Old Guard has quietly moved on from that fiasco. to again turn out votes in the second ward in 2015 as she has no base. Talking Ed Note: Beth Mason and Applied have an arrangement. She has no base and the superintendents of their buildings in the second ward will tell residents to vote for her likely using her ample street money campaign as in 2011. A reliable source tells MSV a major meeting of the Hudson County Board of Freeholders is scheduled to occur Tuesday night on the controversial Monarch Project. The source indicates Tuesday night the controversy over the Monarch Project's status in northeast Hoboken will return to the Hudson County Board of Freeholders and there is insufficient support to see the reneged agreement with Ironstate, re: Applied Housing stopped. 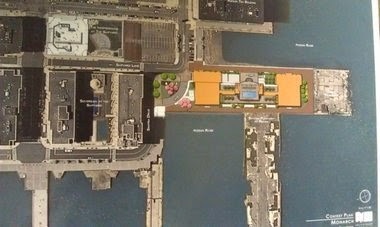 Local activists opposing the Monarch project building two huge buildings out over the pier area next to the Hudson Tea Building see this as a crucial meeting lacking the County legislators nine member body's (Freeholders) support. MSV will publish more details on the slated Tuesday night meeting at the Board of Freedholders in Jersey City.